Cozy Chicks: Scrumptious Sunday...Let’s be Frank! She lives in Dallas, Georgia and serves these - Any time. The recipe was passed down by her mother and went over big for the first company party she hosted for her husband’s job and she’s been serving it ever since. Pour all into a sauce pan, mix well and bring to a boil. Simmer on low until the sauce thickens. (The bourbon will simmer off leaving just the flavor). 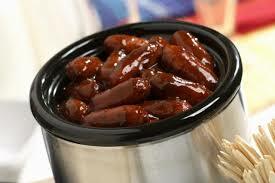 Cut hot dogs into thirds, (can use cocktail sausages or meat balls (have used chicken wings too)) place in a crockpot. Stir in sauce and let it all heat on low for thirty minutes. Can be made ahead of time and kept heated in crockpot during use. Any sauce left over can be frozen and reused. Serve with a nice display of toothpicks. My mother always made this for holidays. It is an easy, fix ahead dish. I found people loved this so you'll need to have extra meat ready to add to the sauce.